What Changed on the Lower Deschutes This Year? Something was different on the lower Deschutes River this year. Water clarity seemed noticeably improved over recent years. Anglers were pleasantly surprised at the size of some aquatic insect hatches, particularly for caddis. Craneflies and midges seemed to be more plentiful as well. So, what changed? Which variable, or variables, in the Deschutes system were different compared to previous years—and different enough to result in these notable changes to the lower river? Many, ourselves included, initially hypothesized that Portland General Electric had simply adjusted the blend of surface and bottom water being drawn through the Selective Water Withdrawal tower. Lake Billy Chinook surface water is composed primarily of water originating in the Crooked River basin. This surface water is warmer, and richer in nutrients and agricultural pollutants, than the water near the bottom of Lake Billy Chinook, which is primarily of Metolius River origin. As a result, we have long advocated for significant increases in the percentage of bottom water drawn through the tower, to be discharged to the lower Deschutes. If PGE had increased the amount of bottom draw coming through the tower this year, we would expect to see improvements in water quality. This explanation, however, didn’t pan out. A close examination of the Project’s blend data from 2018 showed no significant changes from the blends in previous years. In other words, the percentage of surface water being drawn from the reservoir this year was similar to previous years of SWW operation. So what was responsible for this year’s improved conditions? We believe a likely explanation, or partial explanation, for these changes in the lower river is that this year there was simply less Crooked River water entering Lake Billy Chinook. Snowpack in the Crooked Basin was extremely low last winter, resulting in well-below average flows throughout the spring and summer. The hydrograph below compares 2018 flows above Prineville Reservoir (the green line) to average flows in that location (the red line). These reduced flows above Prineville Reservoir, particularly in the winter and spring, ultimately resulted in a significant reduction in Crooked River water entering Lake Billy Chinook in 2018. The hydrograph below, from near Opal Springs, tells this story clearly. Note that in 2016 and 2017, there were huge spikes in discharge between January and July; these peak spring flows simply did not occur in 2018 (note that peak spring flows were 10 times lower in 2018 than 2017). This decrease in Crooked River flows could well help explain this year’s changes on the lower Deschutes River. We have often hypothesized that it is the polluted, nutrient-rich Crooked River water that is responsible for many of the observed changes on the lower river since SWW operations began—including new proliferations of nuisance algae, harm to water quality and clarity, and impacts to aquatic insect and fish populations. With less Crooked River water (and its attendant agricultural pollution) entering the reservoir, there would necessarily be less Crooked River water and agricultural runoff being discharged downstream—even if the same percentage of surface water is being drawn through the tower as in previous years. There are almost surely multiple factors at play influencing this year’s lower river conditions, but reduced Crooked River flows and agricultural runoff could represent a big piece of the puzzle. It is also worth noting that even this year, SWW operations are resulting in alarming water quality issues in the lower Deschutes, particularly with regard to pH. The following hourly pH data are from DRA’s water quality monitoring station, located one mile below the Pelton Reregulating Dam. High pH levels are a useful indicator of excessive algal growth and nutrient enrichment in freshwater systems. (For more information on why pH matters, click here). As you can see, daily maximum pH levels were recorded above the basin standard of 8.5 standard units each day between March and November. Note: The width of the graph line represents the daily swing in pH levels from a low in the early morning around sunrise to a peak in the mid-afternoon. The wide range of daily pH readings is directly due to high algal biomass in the river. A complete assessment of this year’s pH data, and all other water quality parameters, will be available when DRA’s 2018 water quality report comes out in early 2019. So even in a year when Crooked River flows were reduced, pH levels were still unacceptably high below the Pelton Round Butte Project. This underscores the need for a fundamental re-thinking of SWW tower operations, to ensure compliance with water quality standards and protection of the aquatic life–and central Oregon communities–that depend on a healthy lower river. This year’s data and observations also point to the benefits we could see in the lower Deschutes if PGE operated the SWW tower to reduce the amount of Crooked River water released downstream. 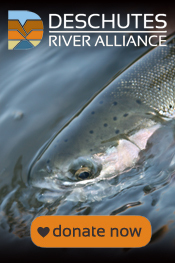 ← Announcing the Deschutes River Alliance 2018 Annual Donor Update!